The deeds for the Inn commence in 1824 and is believed to have been built on land known as the “Nursery Plot” which was leased by William Winsborrow to Hugh Redwood on the proviso that he did not erect a smithy else he would forfeit his bond of £100. In 1828 Hugh bought the “nursery” plot for £27 although it is known that in 1840 he had a mortgage of £50 with Richard Squire. The first landlord, as shown in the 1841 census, was Hugh Redwood (born 1796) who was living with his wife Sarah and their 3 children, Richard, Robert and Sarah. Even at this time it was recorded as the “Redwoods Inn”. Robert later became a farmer at Withleigh. By the 1851 census Samuel Webber (called a “victualler”) and his wife Harriet were at the Inn but by 1861 it was under a Hugh Redwood (born 1823) and his wife Mary Ann plus 5 children. Hugh was born in Halberton although all the children were born in Uplowman. He had previously been a carpenter but took over the Inn and became a wheelwright. Yet by 1871 he had moved to Hockworthy and was back to being a carpenter. By 1871 the pub had changed hands and John Hussey and his wife Maria and their 2 sons lived there, although notably they had staying with them 2 nephews and a niece named Redwood. It was still very much in the family and was to remain so for nearly 30 years. John Hussey had increased the mortgage with Richard Squire (a local farmer) to £300 in 1871 and in 1876 Richard Squire transferred the mortgage to Messrs. Dunsford & Co.
By 1881 although John was still the landlord he was also a carpenter, a man of many trades. There had been another 5 children but it appears that the 2 eldest sons had died. There was a Robert Redwood staying with them, aged 17, who was a printer. John Hussey was still the landlord in 1891 but this time he is back to being a wheelwright and innkeeper. The eldest daughter Emma, now aged 20, was a teacher, possibly at Uplowman School which had opened in 1874. She later married Edwin Steven in 1900 and moved next door to Sanctuary Farm, and was no longer a teacher. Maria had yet another 2 children in the previous decade. John Hussey left the Inn and moved in to the Post Office by 1901. He was now solely a wheelwright with his son Charles assisting, whilst his wife Maria ran the Post Office. The new landlord was Frederick Parr, aged just 28, who had moved from Sampford Peverell with his wife Ellen and their 2 children. There was a further change of landlords by 1911 when it shows that John Cottrell from Bampton with his wife and 3 children, plus a sister, lived there. After the War in 1919 the new landlord was Frederick Bawden. 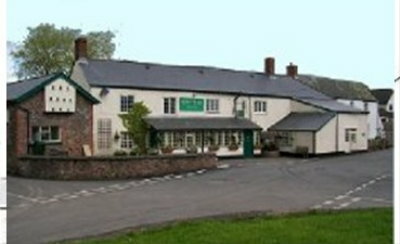 It was during the 19th century (possibly 1890) that the Redwoods Inn was bought by Ushers Wiltshire Brewery Limited (which just happened to have been founded in 1824 the same year the Redwoods was built). Included in the purchase was a cottage and a wheelwright and smith’s shop. Ushers went on to buy John Goggs Tiverton brewery in 1960 the same year it was taken over by Watney Mann. It was eventually sold to a management buyout in 1990 and reverted to the Ushers name but the factory was closed during 2000. Between 1936 and 1972 the Redwoods was run by Norman and Florence Dingle who continued to live in the village at Sellake Cottage after they retired. Until 1970 Mr Dingle was also the village butcher! The Redwoods was sold by Watneys to John Hadden, a former accountant. 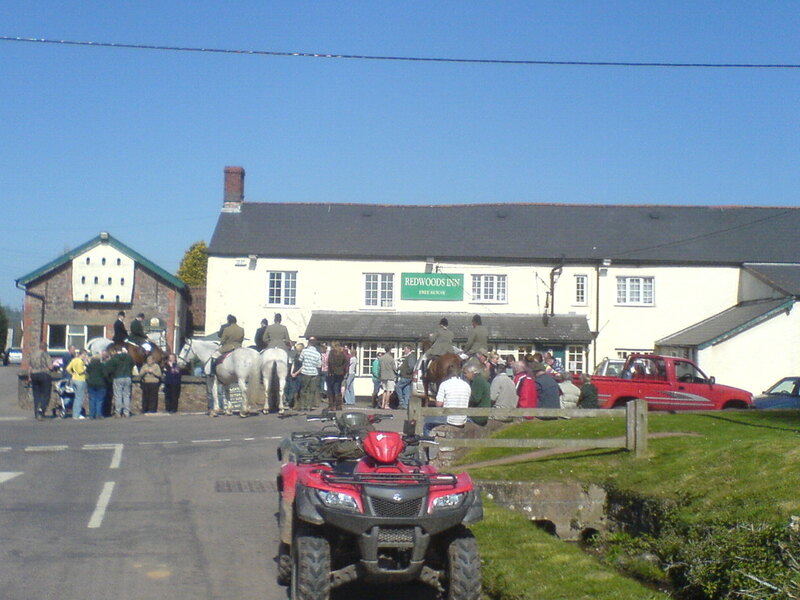 In February 1993 it was closed down by the landlords Bob & Angela Parrott due to lack of trade during the recession and the village was without a pub. 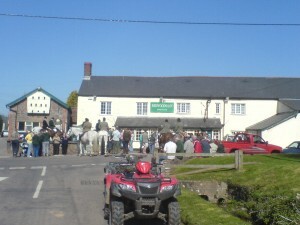 Eventually that year it was reopened but only after a legal wrangle when Alan Ball’s (the ex England international) wife Janet had applied for a protection order to run the pub but police lodged an objection because her business partner, Reg Payne who had bought the pub from the receiver, undertook works costing £85,000 without permission. Eventually Mrs Ann Elsworthy from Uplowman was granted a licence by Tiverton justices to run the pub. Subsequent owners/landlords have been Derek Palmer, Simon Ede and in 2005 it was bought by Paul Hayman and Juliet Newcombe. The Redwoods has changed over the years, especially since WW2 when it acquired the now skittle alley (formerly a butchers), and extended into the bar area, plus added on the dining room annex. All in all some major changes, and demonstrates how crowded it must have been in 1891.